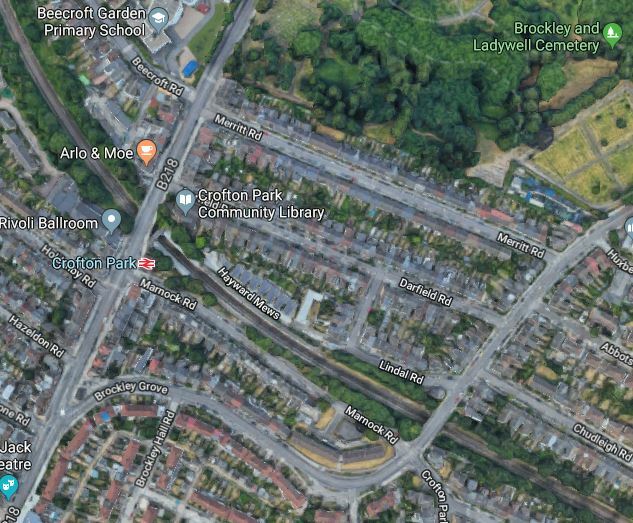 I was alerted to the problems of access to trains at Crofton Park station, by a reader to this blog who commented here. So as I was passing through, I decided to stop and take a few pictures. The pictures are in order, as I walked around the station. I walked to the Southern end of Platform 2. I used the step-free access to exit the station. I walked across the railway on the nearby road bridge on Ley Grove. There wasn’t one step on the route. These are my comments on various issues at the station. The simple step-free access on the Southbound Platform 2 is shown in full. Both platform access paths are similar and easy, although there is a slope up to Ley Grove and the bridge across the railway. This Google Map shows the Platform 2 access. The wide platform, the two contactless card readers and the seat by the entrance can clearly be seen. It is a simple design that seems to be well-used by passengers. And not just those who need step-free access. This type of entrance may work well in London, because contactless ticketing is commonplace. But would it work all stations, where ticket checking is non-existent or a ticket needs to be purchased before getting n the train? The locals will know about the entrances, but surely better signage is needed from the road across the bridge to these two entrances. These are pretty typical of Victorian stations and are fairly long and steep. The Southbound access is not too bad and is a typical step common all over London, but Northbound access is high with a chasm between the platform and the train. The Google Map shows the reason. 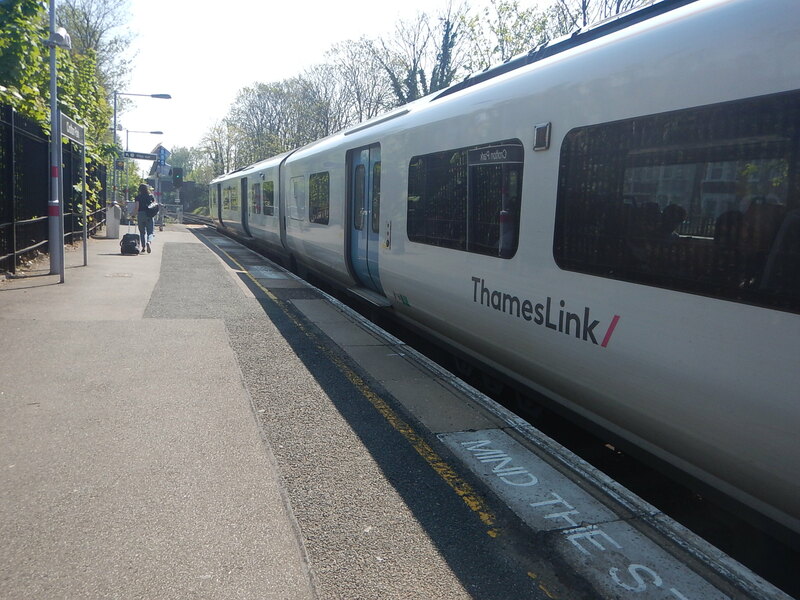 Partly the reason is the curve of the railway line and the platforms, which rules out the standard solution of a Harrington Hump in the middle of platform, which is usually placed correctly by Thameslink to be by the wheelchair bays on the Class 700 train. I think the map also shows that to straighten the line through the station would be a major undertaking and probably mean closing the station and the railway line for a couple of weeks. But as a lady said to me, a friend of hers fell into the chasm. Perhaps the only solution is to have a powered wheel-chair lift like a fork-lift truck, as the Germans do at some stations. One on each platform and staff to man it would probably be more affordable than rebuilding the station. There may also be an alternative solution for walk-through trains like the Class 700 train or London Overground’s Class 378 train. This picture shows the Southern end of Platform 2,, with a train alongside. Note that the end of the platform is straighter. Why not put the Harrington Hump, in this position? It would be alongside the step-free access to the station. It would not be a major construction. It could perhaps be twenty metres long. It helps that all trains stopping at Croftton Park station are eight-car trains. Phone apps to instruct passengers what to do at particular stations are getting better and more comprehensive. As the trains are walk-through, passengers can move forwards the front before arrival, if they are getting out at Crofton Park station. Crofton Park station’s simple method of step-free access icould be used at many stations. But we also need a method to deal with the curved platform problem and the chasms, it creates. These pictures show Southall station. The station still needs the new footbridge to be installed and lifts from the station buildings to the platforms. It appears that there will be a Crossrail train every six minutes all day in both directions. This picture was taken on July 4th, 2016. Note the footbridge across the station, that doesn’t appear in the pictures I took today. This picture, that I took today, clearly shows blue barriers around places where the footbridge might be installed on the two island platforms. Is it a replacement bridge over the station being installed, or is it just a footbridge connecting the platforms? Or could it be for both purposes? This map from carto.metro.free.fr shows the layout of lines at Southall station. The pair of lines in the middle are the fast lines. The single line going off to the East is the Brentford Branch Line, which has been proposed for reopening. 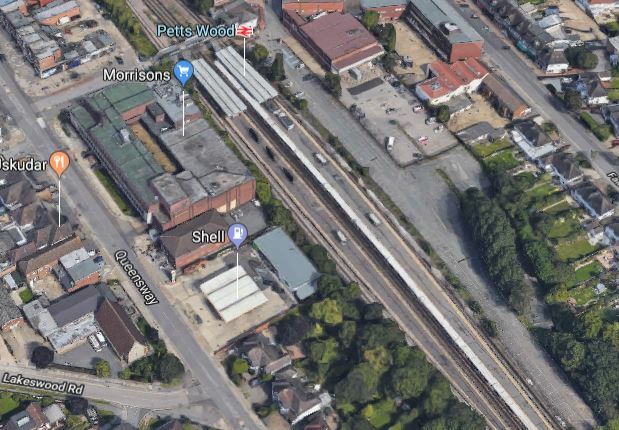 It would appear that the layout of the footbridge and the lifts would give good access to the Southernmost platform, which is connected to the Brentford Branch line. 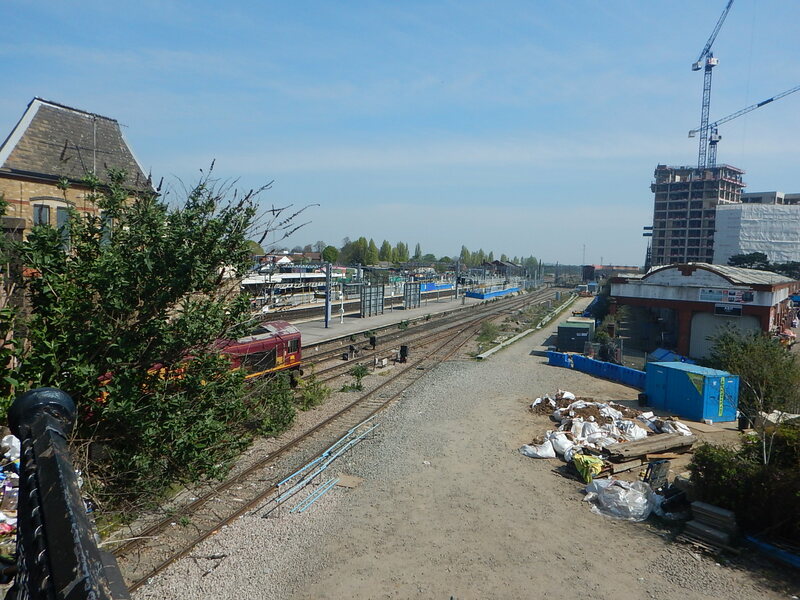 So it looks like, that after the station has been refurbished and made step-free, connecting the Brentford Branch line would not be difficult. 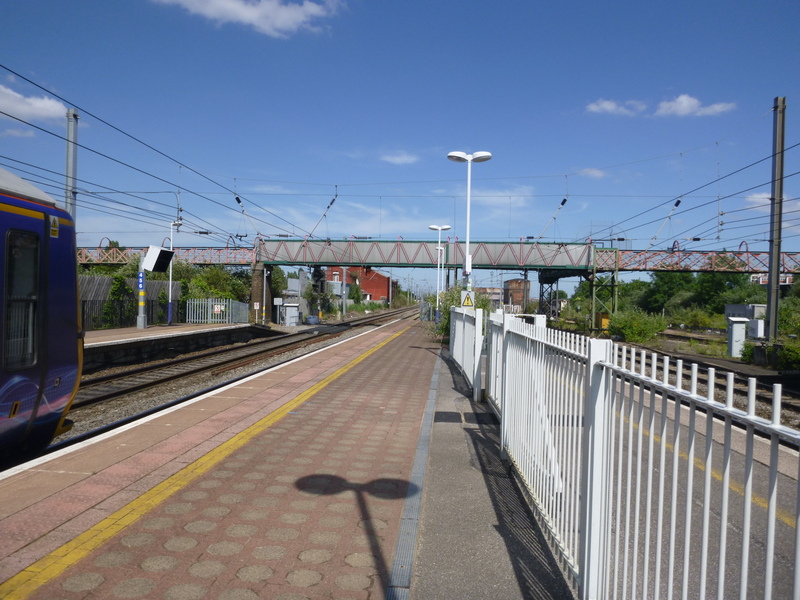 As the Brentford Branch is only four miles long, a modern train like a Class 230, Class 710 or a Class 321 Hydrogen train, could do two round trips per hour between Southall and Brentford stations. As current rumours are that Crossrail will open in December to Reading, it looks like the station will be usable. It is planned that Southall station will have a train every six minutes. As I passed through Waterloo station, yesterday, I happened upon, this display of the designs for the Network Rail Footbridge Design Ideas Competition. If you are interested in design or have movement difficulties at times on the UK rail network, and regularly pass through the station, it is worth taking a look. Chatham station is on the list. The station building is above the tracks. There are two staircases from the building to each platform. The platforms are reasonably wide. It might not be an easy station to provide full step-free access. 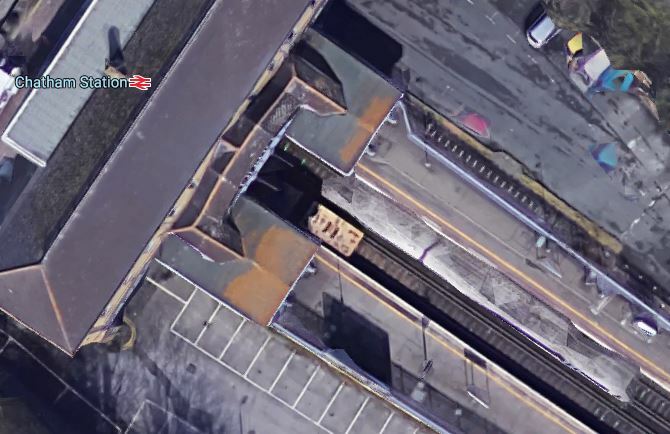 This Google Map shows the Eastern side of the station building. You can just see the stairs at the back of the building. 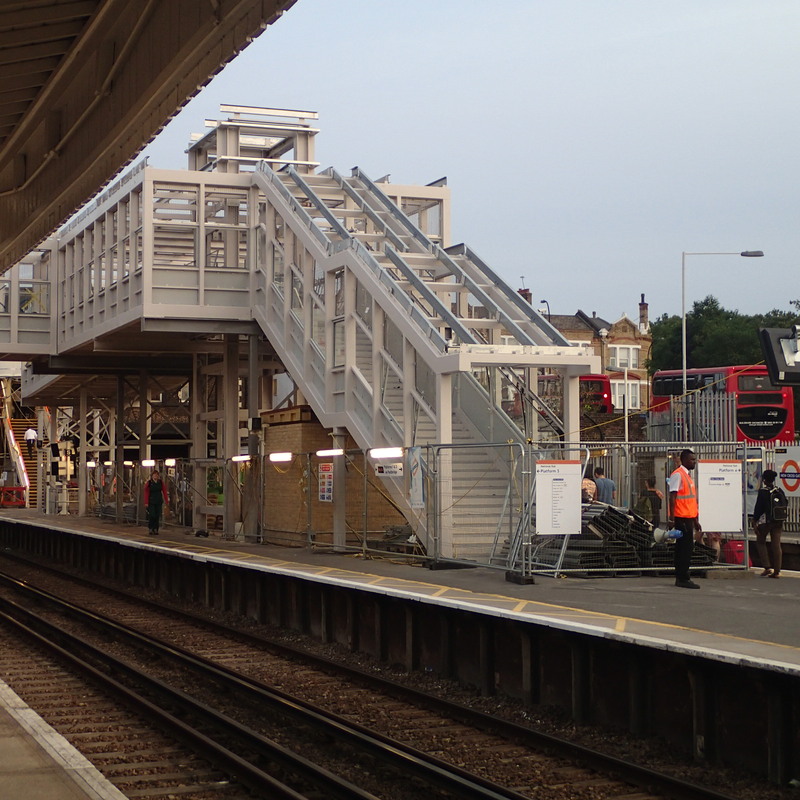 In stations with similar layouts, Network Rail have built new stairs and lift structures, like these at New Cross Gate station. Could something similar be squeezed in at Chatham station? It would be difficult but podssible, in a station that handles nearly three million passengers per year. Herne Bay station is on the list. These pictures show the station and the current subway. The station has two platforms, with a closed third platform. The Eastbound platform is Platform 2, with the Westbound platform numbered 1. The two platforms are connected by a very bad subway, with steep stairs at either end. There are three trains per hour (tph) in both directions through the station. Whilst I was at the station, there were three guys with bikes using the trains. In my experience, coastal stations attract visitors with buggies and bikes. There are a higher proportion of older passengers. Good weather can increase passenger numbers. It is without doubt the sort of smaller station on the coast, that needs step-free access. When I first saw the subway, I thought it could be possible to just add a lift at each end. But looking at the station and the pictures on this page, I wonder if a bridge would be better. The subway is rather cramped and might not be wide enough for a large wheelchair or buggy to pass another. Digging the lift shafts would probably close the subway for at least a few weeks. There appears to be space at the Eastern end of the station for a bridge. Adding a bridge wouldn’t interfere with the siubway operation. If the station had both a bridge and a subway, the extra capacity would be welcome and might help reliability. 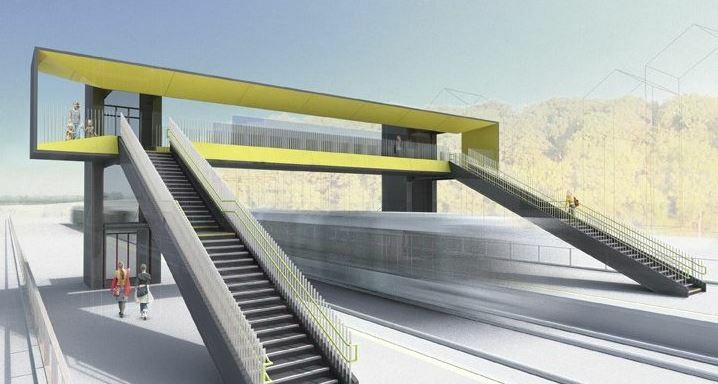 Could a factory-built bridge like this be used at Herne Bay station? The bridge would be designed to fit. Platform 2 would probably need to be widened, so passengers could pass the steps to get to the lift. I think it could be made to work very well! Uddingston station is on the list. Note that Uddingston station has a fair amount of car parking, that is arranged on both sides of the tracks. So if a traveller commutes or goes shopping in Glasgow, they have to cross the bridge at least once on their two journeys. Could a factory-built bridge like this be used at Uddingston station? I think, due to space limitations, it might need to replace the current footbridge. The advantage of placing it in the same position, is that the lift on the Northern side is close to the disabled parking spaces. Beaconsfield station is on the list. This is a Google Map of the station. Note these points about Beaconsfield station. There are entrances on both sides of the railway. The station is in a deep cutting and the paths down to the station could be easier. But this seventy-one-year-old managed them! Currently, three trains per hour (tph) call at the station in both direction in the Off Peak, wwith more in the Peak. There is space between the current two tracks for an avoiding line. The platforms are very long, although I would prefer them to be wider. The station also has the problem of many stations used by shoppers going to a nearby large city. Many travellers come home in the evening carrying a lot more, than they left with. So do travellers want to cross a bridge without lifts carrying heavy, bulky or just plain awkward parcels, to get back to their car? I’m fairly certain that a bridge at this station might encourage more travellers to use the train rather than their car for a trip to London. So I can certainly understand, why it is on Network Rail’s list. 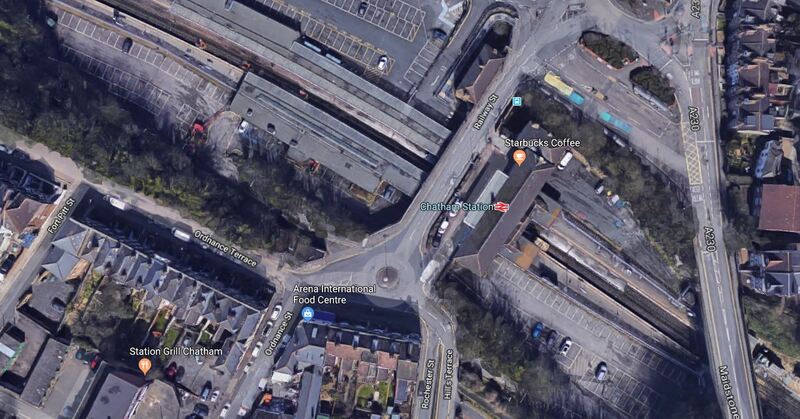 I think that this could be one of those stations, where a solution similar to that at Slough station can be used, where the old bridge was given a good refurbishment and a new step-free bridge was installed on the other side of the station entrances. 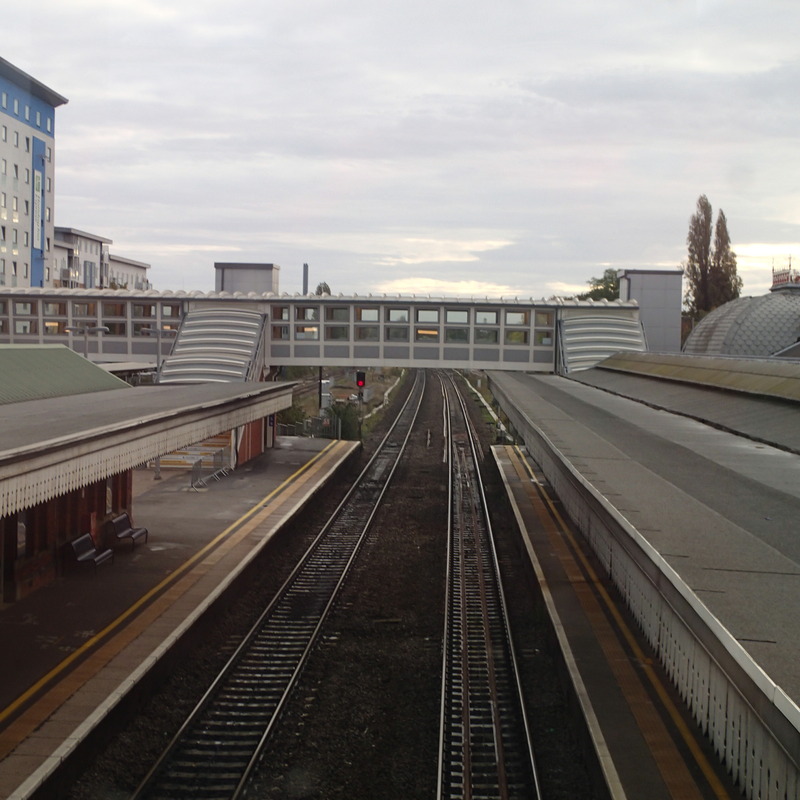 This picture, which was taken from the original bridge, shows the new step-free bridge at Slough station. It is a good design philosophy, which has advantages. During the installation of the new bridge, the station can be fully operational. Able-bodied travellers can choose their best route. Two bridges have a higher capacity than one. It is unlikely both bridges will be out of action at the same time. The only extra cost will be refurbishing the existing bridge. So could a factory-built bridge like this be installed on the Eastern side of the station buildings? 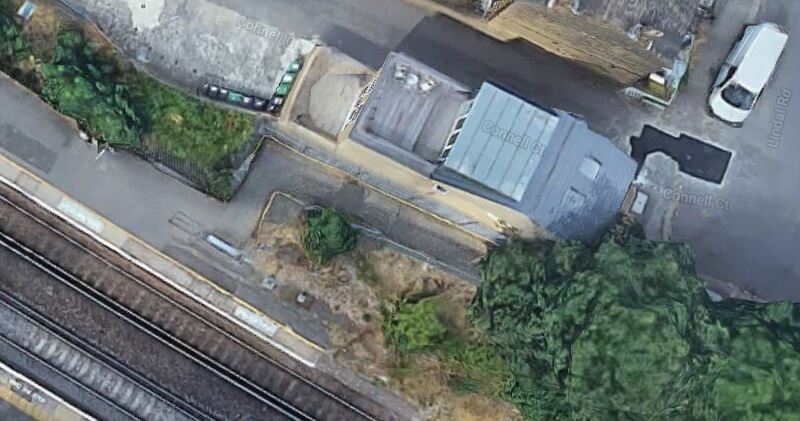 This enlarged Google Map shows the Eastern end of the station. If the bridge were to be placed with the lifts on the Eastern side, the lift on the London-bound platform would be conveniently close to the disabled parking bays. It would also mean, that travellers with walking difficulties or encumbered by heavy cases or young children, could get in the rear coach at Marylebone and be ideally placed for the bridge to get to the car-park. Note that the main taxi office is placed for trains from London. More able travellers could use either route, depending on where they were going. Beaconsfield could be a station, with step-free access of the highest quality.